Who is the man selling plants in the SCC? If you were wondering what an oasis of greenery was doing in the middle of the Shapiro Campus Center on Oct. 17 and 18, or why people were leaving with tiny plants, wonder no longer. It was just Randy Skolnick, Brandeis’s friendly neighborhood plantsman. Only on campus for a couple days a year, and with no clear advertising by the Department of Student Activities, his presence on campus seems evanescent. But Skolnick manages to make an impression anyway, because he is not your average vendor. It’s not just that he grows and sells a wide variety of miniature plants. There is a charisma about him –– an infectious love he has for his life and livelihood, as if they were one and the same. Whatever the appeal, it has continued to draw people, familiar or new, to his plant sale year after year. Reminiscing on his career in an interview with the Justice, Skolnick confessed that his interest in plants began by accident. He reflected, wistfully at first, on how a girl had broken his heart many years ago. “My neighbor bought me these three plants to console me, and I killed two. And then,” he recalled more fondly, “She gave me my first plant lesson.” It inspired him to put all the energy from his heartbreak into growing plants. According to his wife, June Skolnick, a recently retired teacher, Randy became a plant entrepreneur. “I owned a flower shop for 20 years, and I had a flower shop across the street from that for 10 years,” said Randy. “That’s 30 years. But I don’t really consider myself a florist. I owned a florist shop,” he clarified. To this day, he has retailed everything from bonsais and succulents to orchids and folia, and even fish. He transitioned from his shops to college campuses about 18 years ago. “I loved it. I miss it. But I wouldn’t do it again because the marketplace has changed,” he said, citing competition from chain stores such as the Home Depot and supermarkets. “I mean, if someone told me they did what I do, I’d think they were out of their minds,” he added. Skolnick originally sold his plants at schools close by, like Fordham University, Columbia University and the Fashion Institute of Technology, but eventually expanded to the rest of the Northeast. He has been to universities in Massachusetts, Connecticut, New Jersey, New York and Pennsylvania, at one point visiting 40–50 campuses during the season. He also dabbled in the corporate sector, bringing his plants to name brands, such as Aetna Inc., PepsiCo and Sikorsky Aircraft. “And then I used to do all the flower shows,” he said, elaborating, “I would leave, like, on a Tuesday, build my booth, do the show all week, come home Sunday night, sleep Monday and then leave for the next city Tuesday.” He eventually stopped going to the shows, limiting his work travels to universities to be able to spend more time in New York with his family. Skolnick reached Brandeis 12 years ago, initially setting up in the Usdan Student Center. He faced poor sales, however, due to the many exits and entrances, which made it easy for students to walk in and out without ever seeing him. “And then I went outside on that walkway, and I had my best day ever. … And I don’t know why I never did it on the walkway again. I don’t think they [Brandeis administration] were so crazy about it,” he admitted. So he settled down in the Shapiro Campus Center, where he has been ever since. His favorite plant is Rhipsalis, a type of succulent that grows in trees. “It’s a very weird, ugly plant,” he acknowledged, explaining that just because he likes “very odd plants” doesn’t mean they will sell well. 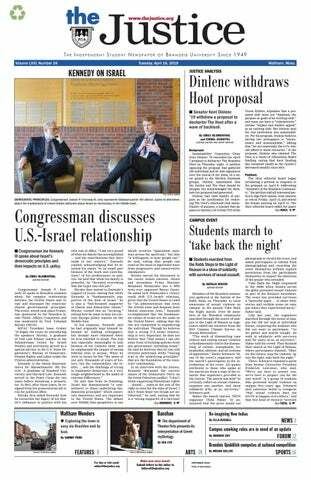 Students at Brandeis, he said, tend to like succulents and money trees the most, but not orchids, for some reason. Although Skolnick now considers himself semi-retired, working only five or six months a year, he continues coming to schools like Brandeis, enjoying the energy and enthusiasm of the students. “I don’t think me being Jewish had anything to do with it,” he joked. He also enjoys the campus for its ease of access compared to universities closer to Boston. At Clark, for example, he had to “go through a parking lot, down to the basement, cross the building, [and] back up in an elevator.” He even once had his truck towed at Tufts. When asked if he would be coming back to Brandeis next year, Skolnick teased, “if I’m still alive and capable.” He said that he enjoys coming to colleges the most because hanging out with the students makes him feel young, especially after he received his first social security check. COUPLE GOALS: Now that his wife June is retired and he only works six months a year, Randy often brings June along with him to sell plants across the northeast. For now, however, Randy and June Skolnick have returned home to New York, where they will be selling orchids until around Thanksgiving (in Manhattan on weekends, and across the street from Macy’s and Herald Square during the week). Assuming they sell all their remaining plants by then, they are looking forward to shutting down the business for the winter to take a much-needed vacation and spend time with their new grandson.